The cast of The CW’s The 100 made the trek to the 2019 WonderCon to participate in a panel for the much-anticipated (and long-awaited) sixth season. Those fortunate enough to grab a seat in the panel were the first to see season six’s premiere episode. In addition, fans had the opportunity to participate in a Q&A with the cast and series creator/executive producer Jason Rothenberg. The 100 stars also sat down for roundtable interviews in support of the April 30, 2019 season premiere. 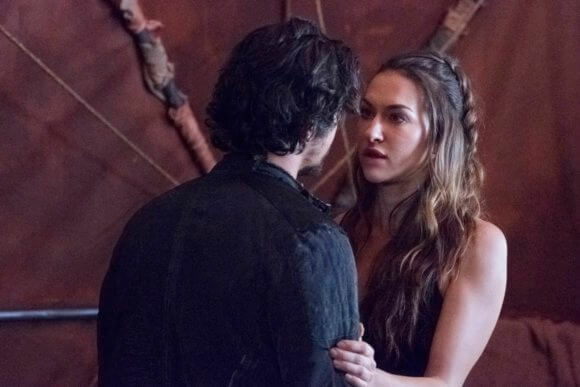 Tasya Teles talked to us about Echo’s approach to this new world, Echo’s relationship with Bellamy, and missing characters who’ve exited the series over the past few seasons. How is Echo coping in the new world? Tasya Teles: “You know, I’m really happy. It was a surprise that Echo loves space so much because to me she is such an earthy person. She’s a warrior and they’re very visceral people, and so being in space I thought was going to be a departure, like a tough time for her. But she actually enjoyed it because she was like, ‘This is relaxing. There’s no weird bears with two heads,’ etc. etc. How long is she in this new world before Echo finds herself in some drama? Well, you get to relax during episode one. Is the relationship between Echo and Bellamy tested in the beginning of the season? How is that going? Did Bob Morley direct you in his episode? This season is the start of Book 2. Did it feel like a new show going into it? How does she feel about Madi this season? What does Echo believe in at this point? Sometimes Clarke goes against Madi’s wishes. Would Echo be taking Madi’s side in those instances? We’ve lost so many characters over the seasons. Are there any that were close to your heart that you miss? You’ve potentially got 400 new characters in the pods. Initially there will be the landing crew, but how long does it take for us to see everybody? The trailer was beautiful and the sets looked gorgeous. Was there any particular part of the set that you really enjoyed? Will you get a chance to interact with the new characters coming in? You didn’t get to interact with many of the newbies last season.